Obtained results fit the theoretical predictions very well. 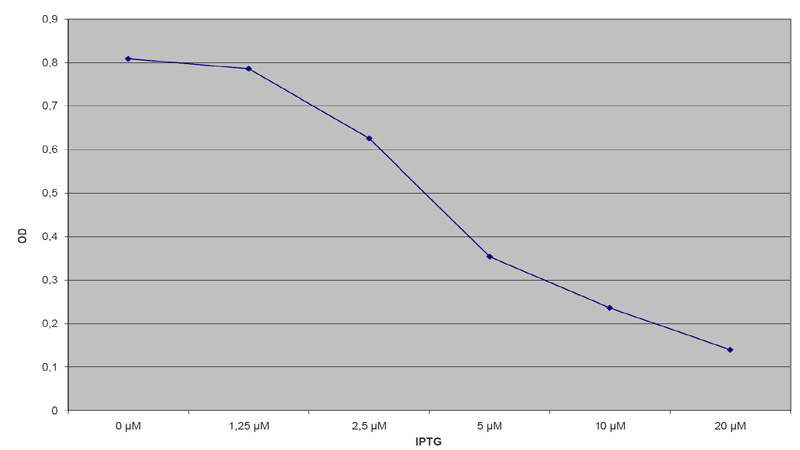 pSB-pT7-B0032-MinC displays severely decreased growth rate. 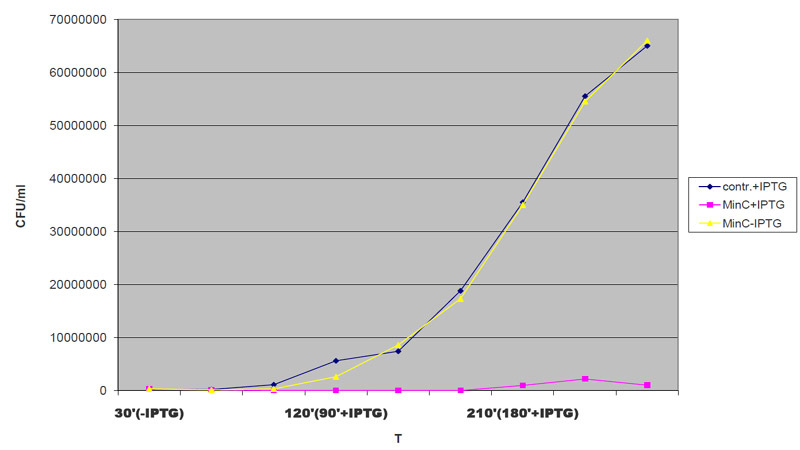 Growth in the samples, where pSB-pT7-B0032-MinC was not induced and where the construct did not include a promoter, was not visibly affected. Therefore we can conclude, that neither the potentially leaky promoter nor the toxicity of IPTG cause any unspecific decrease in the growth rate. The difference in growth of induced construct and the controls is also much more pronounced when measures by the number of colony forming units (rather than by OD). This in agreement with the expected effects of MinC overexpression, which is supposed to inhibit cell division. Agar plate during 150 minute of IPTG induction shows striking difference between the experiment (right side of the plate) and our two negative controls (down and left). Stationary measurements prove the dosage-dependent mode in which MinC affects the bacterial cell. Like previously, the effects are more drastical when CFUs are considered. 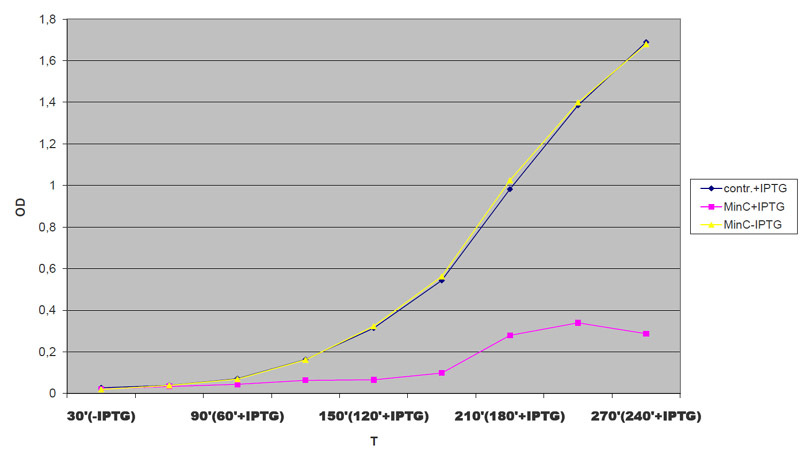 For the IPTG concentration of 2,5 μM the number of CFUs was below 106 per ml. For concentrations of 5, 10 and 20 μM it was below 104 CFU/ml (over 106-fold decrease in the number of viable cells compared to uninduced culture). During our experiment, we were able to see under the microscope filamentous E.coli cells formation. This observation is consistent with theoretical basis of MinC function. MinC stops cell division even though bacterium can grow and enlarge its size (within certain limits). An alternative construct for MinC expression was obtained. Unlike the one measured above, it contained a B0034 RBS. Cloning was preformed in DH5α cells. 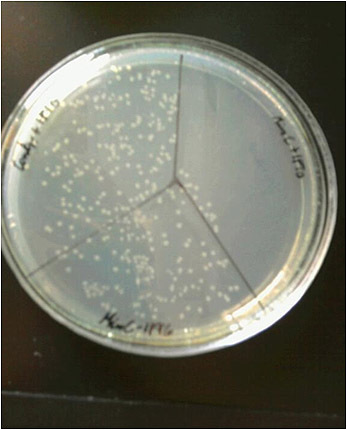 However, all attempts to transform BL21 cells failed, even when the bacteria were plated on LA medium without IPTG and with glucose (for additional repression of T7 polimerase). This observation confirmed the significance of modulating kill-switch expression. B0034 RBS is over 3-fold stronger than B0032. Apparently, even a highly specific promoter, such as the T7 promoter, can display sufficient leaking to inhibit baterial growth. 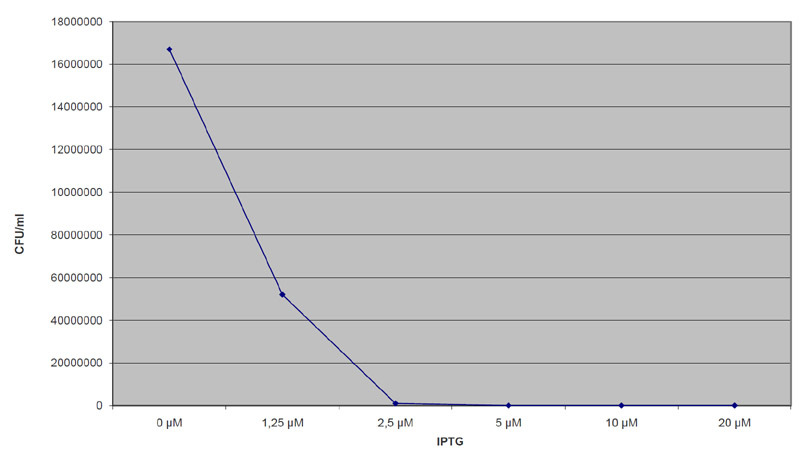 The reason why this effect was not observed in DH5α was the lack of T7 polimerase gene in this particular strain.